They battled just to get that far. They battled their way past a bit of a rough start to the season. So, there was absolutely no way they were going to go down without a battle. And the Valiants battled — wow, did they battle — right to the very end. The Valley Catholic High School girls soccer team, after falling behind 1-0 in the 25th minute, tried to battle back the rest of way, really turning up the intensity in the final 20 minutes of play, but the Valiants couldn't score the equalizer, as they fell 1-0 to Hidden Valley in the Class 4A state championship match, played Saturday at Liberty High School. 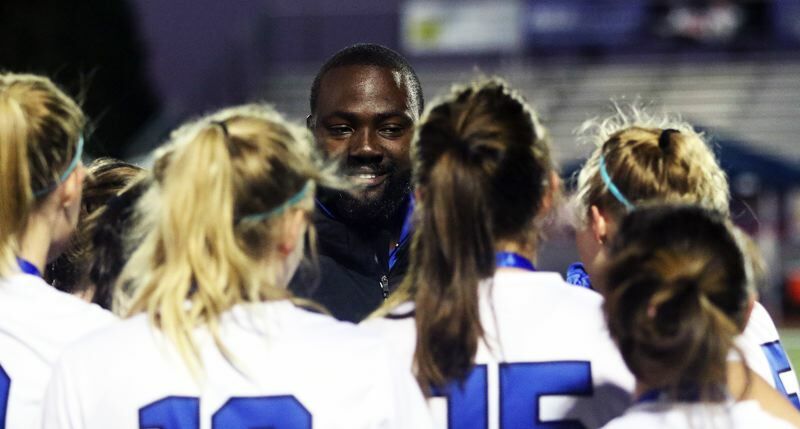 "At halftime, (first year Valley Catholic coach) Kibwe (Cuffie) told us that we came too far to give this up," said Valiant senior forward Callie Kawaguchi, who helped lead the second-half charge. 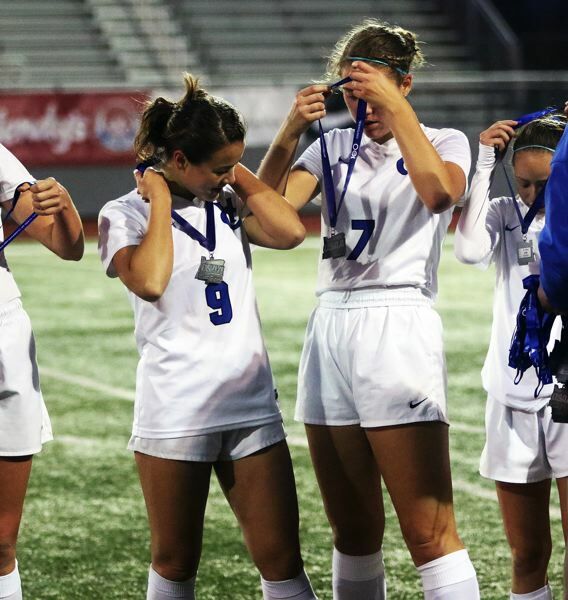 "And I think we all wanted this so badly, especially since there are so many seniors on the team. I think we just started pushing as hard as we could. We've been in this position before, so we knew what do do. We kept pushing. It wasn't enough, but I think that if we had more time, we could have gotten one." "Today didn't go as we hoped, but we're just so really happy that to come out and play here," Valley Catholic senior forward Chloe Brock said. 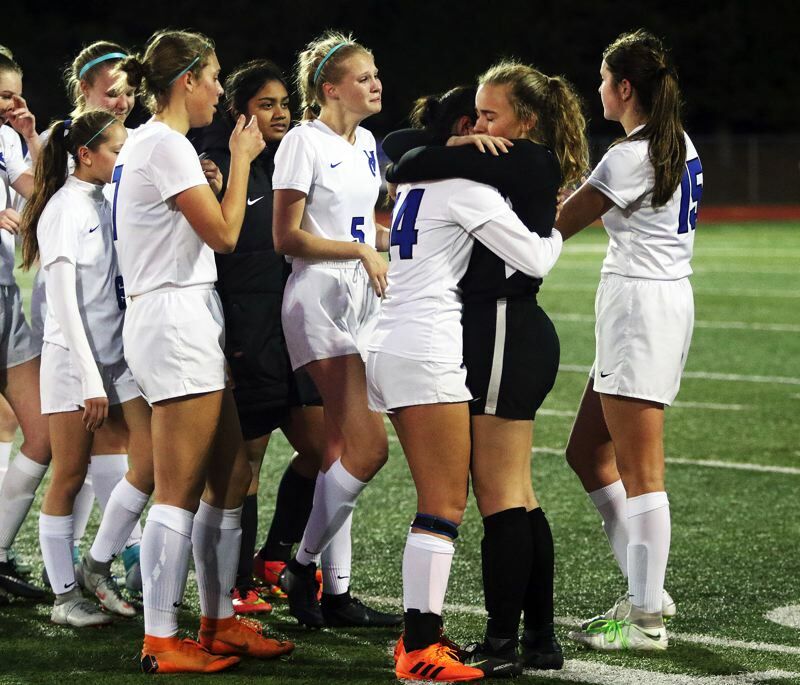 "I love my teammates, and, for my senior year, I couldn't ask for anything better than to have the opportunity to come out here and play at state one more time. At our school, we say 'be valiant' a lot. It's kind of our motto. What that means is that, when we're faced with adversity, we're going to keep it up and fight, and keep going strong and try." 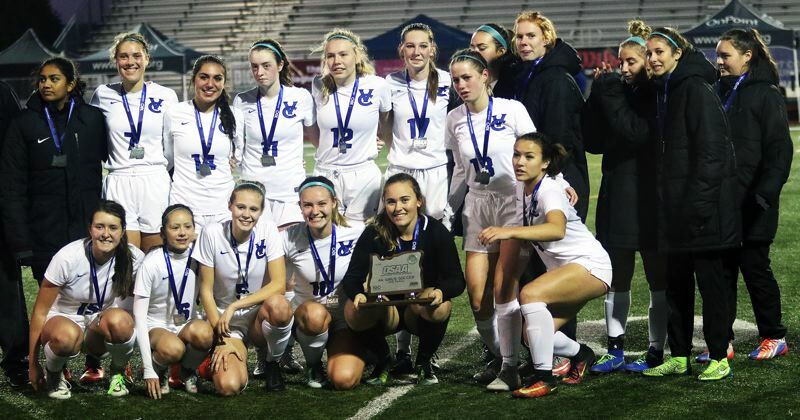 With the win in a rematch of the 2017 state title contest, which Valley Catholic won 1-0, Hidden Valley, the Skyline Conference champion, and the No. 1 team in the final OSAA power rankings, finished its season with a final overall record of 17-1. Valley Catholic, the Cowapa League champion, and the No. 3 team in the power rankings, finished its season at 13-3-2. 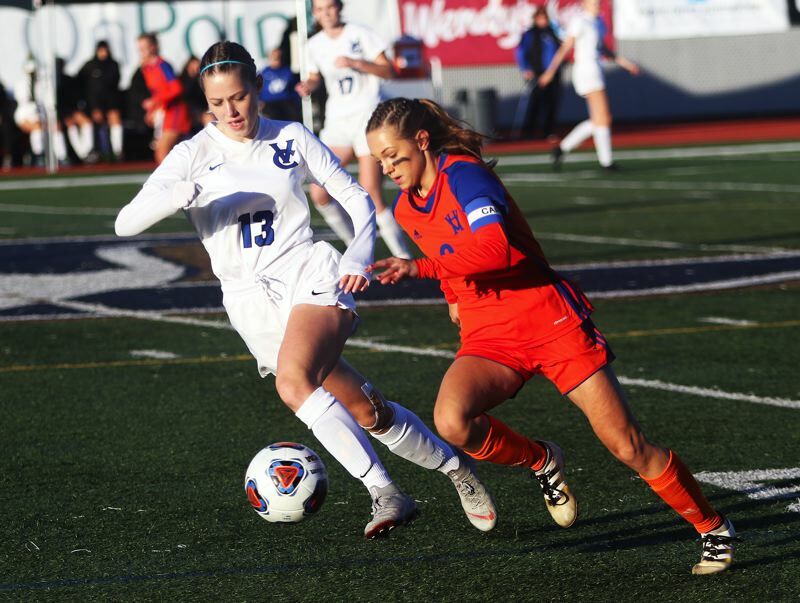 "It started off kind of rocky," Brock said of the Valiants' 2-2-2 start to the season. "We lost a couple of our captains from last year, so we had to adjust, and we got a new coach. But we really bonded together as a team." "It's been a pretty up-and-down season," Kawaguchi said. "We lost our goalie and our star midfielder from last year, so we weren't really sure how the year would go. We also lost our head coach, who we had been working with for years, so it was a huge mix up. The first few games were pretty rough, and we didn't know if we would make it, so being here is huge for us." 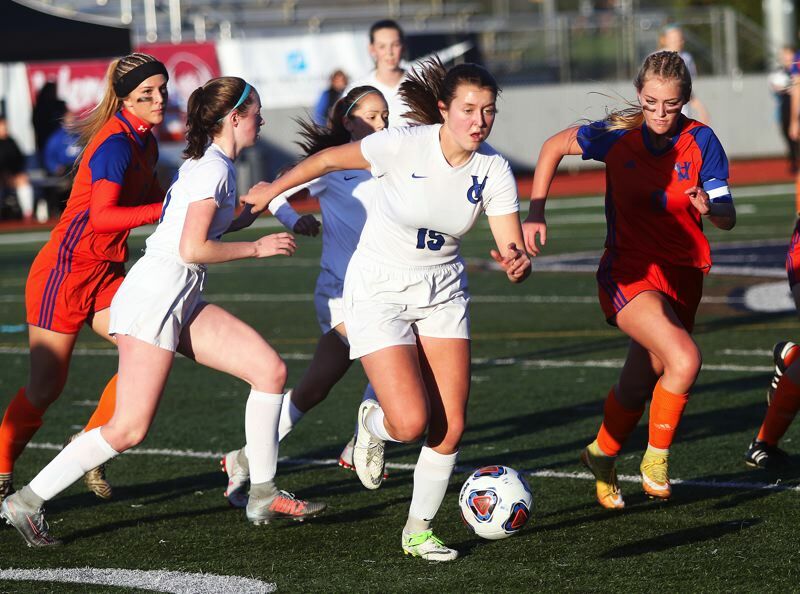 Hidden Valley, in Saturday's state title match, went on the attack early, getting a pair of shots on goal by junior Bella Heverly. 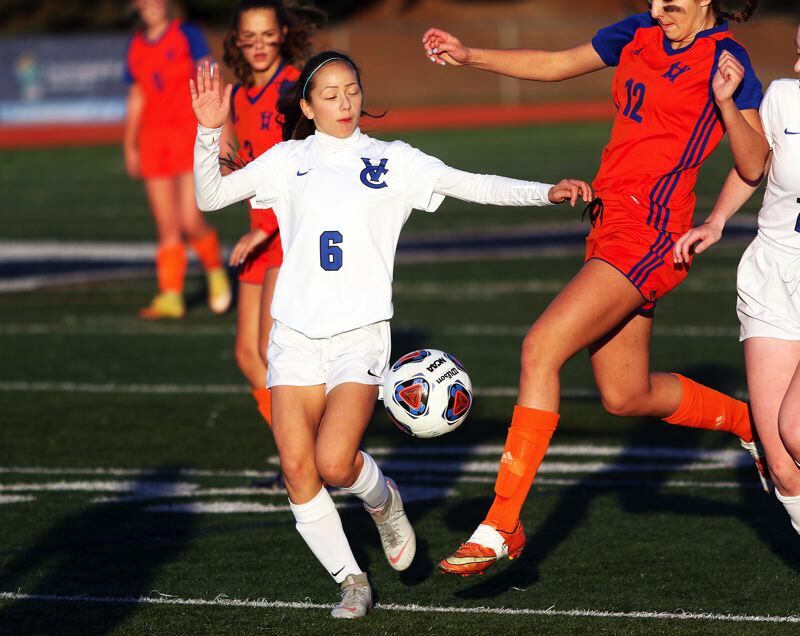 But the Valley Catholic defense, including senior Katelyn Snook, junior Parissa Sabet, senior Johanna Filip, senior Josephine Clark and senior goalkeeper Annmarie Gallardo, among others, kept the Mustangs from converting. 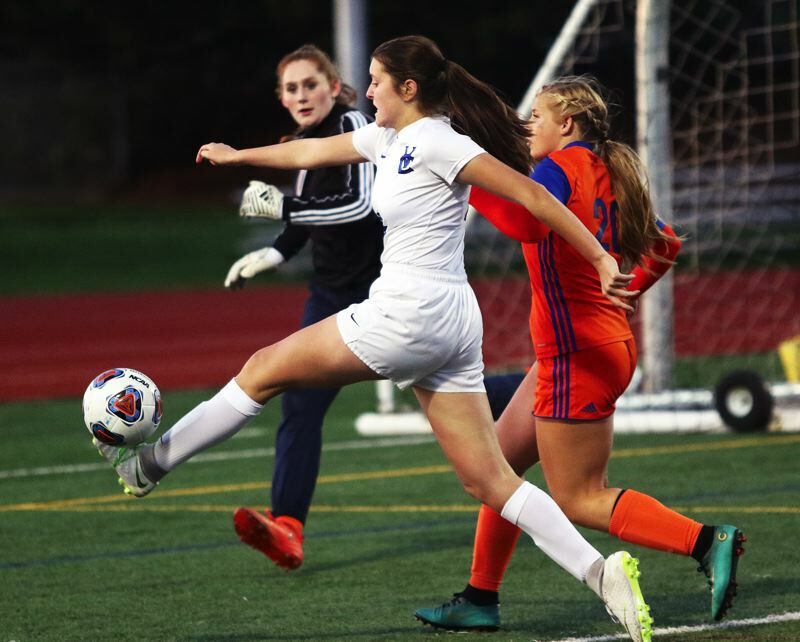 Hidden Valley came close to scoring, with a shot by senior Nyah Kendall hitting the crossbar of the Valley Catholic goal with 19 minutes and 11 seconds left to play in the first half. But, soon after, the Mustangs were able to convert. 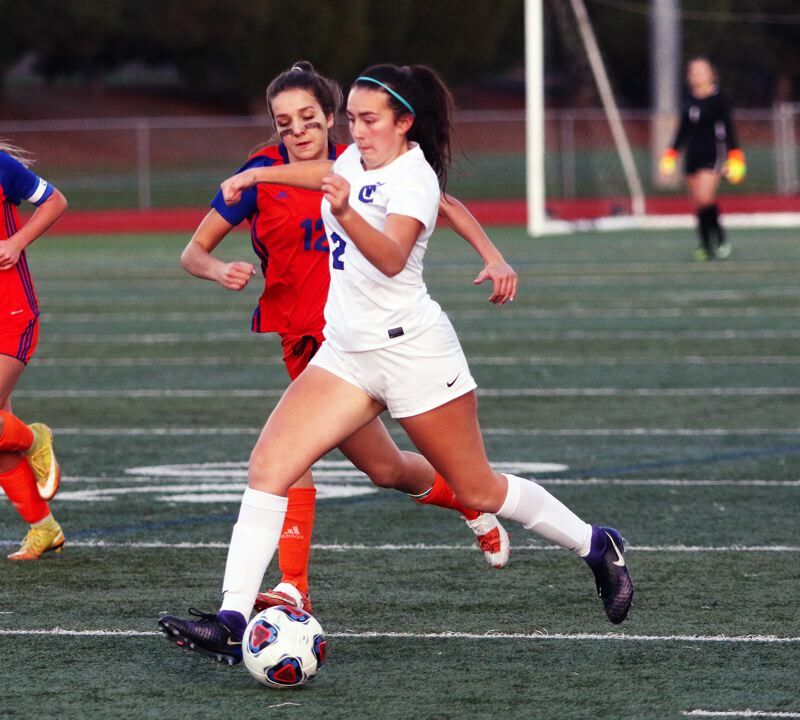 Hidden Valley sophomore Emily Bergeron, after taking a touch pass into the box from Kendall, hit a ground shot from 11 yards out, with the ball bounding to the back of the net, giving the Mustangs a 1-0 lead with 14:25 remaining in the first half. That seemed to light a fire under the Valiants. 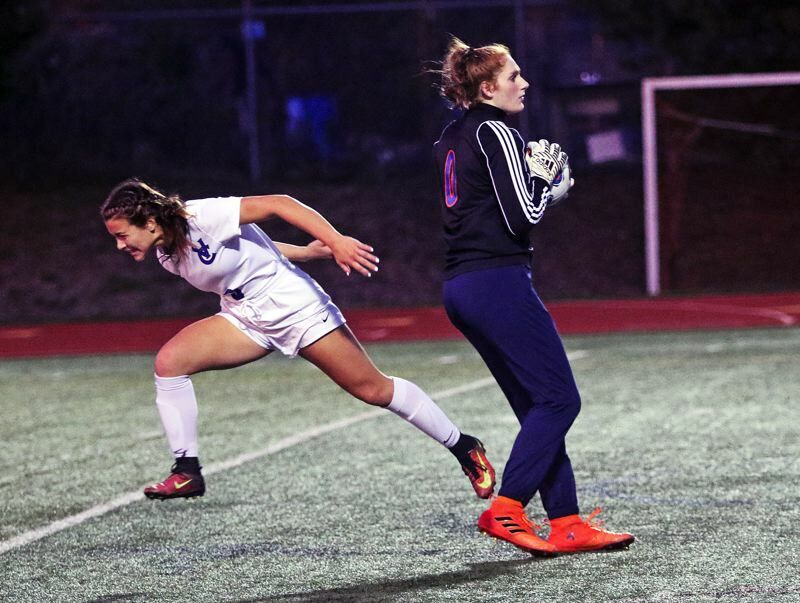 Just over a minute later, Hidden Valley sophomore goalkeeper Kaiah Fisher had to come running out to block a shot by Kawaguchi from 23 yards out. Then, with 11:34 left in the half, Fisher deflected a Kawaguchi attempt off the left post of the Hidden Valley goal to a corner kick. Fisher then leaped to grab Snook's ensuing corner kick in front of the Mustang goal. 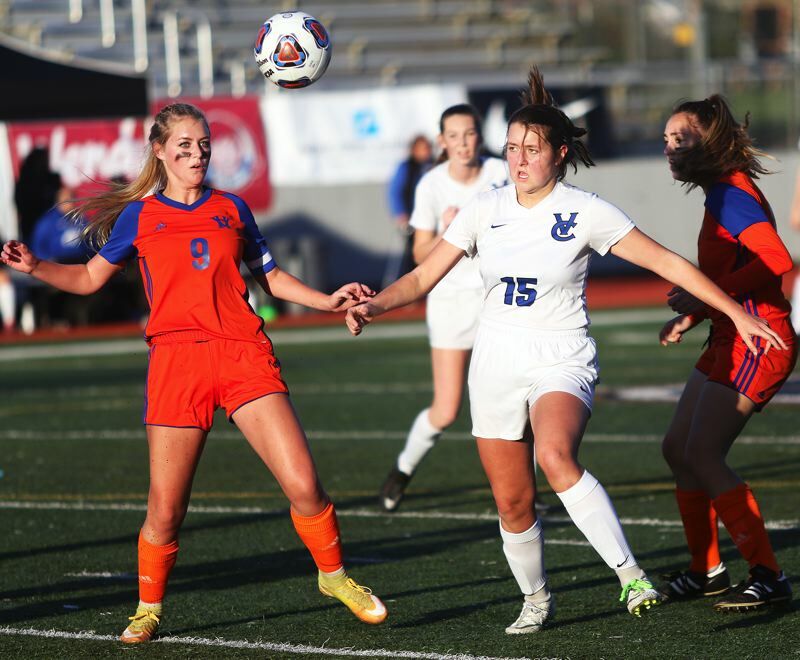 Valley Catholic junior Riley McGee and Brock each had shots in the final minutes of the first half, but the Valiants found themselves still trailing 1-0 at the intermission. 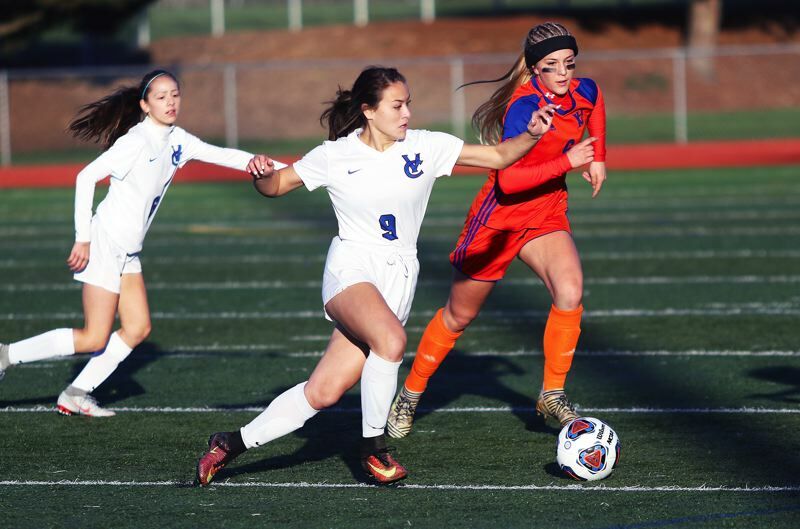 The teams' defenses seemed to dominate the first 20 minutes of the second half, but, soon after, the Valley Catholic offense seemed to take control. Kawaguchi looked to have a chance at the game-tying goal when she hit a hard, bending shot from 22 yards away from the right side. 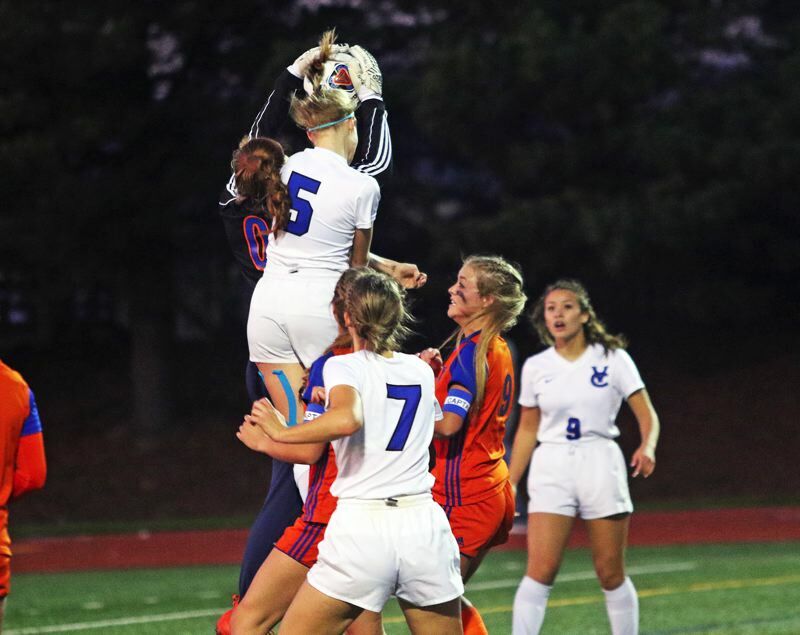 But, at the last moment, the 6-foot Fisher, leaping out and reaching as far as she could to her right, was able to get her fingertips on the ball, slapping it away from the goal. "That goalie is good," Kawaguchi said. "Yeah, I jumped up and thought 'that's in,' but she got it. She's a very good goalie, so good for her." But the Valiants kept trying. Just over a minute later, Kawaguchi, after taking a pass from freshman midfielder Casmira Fox, hit a shot from 20 yards away, with Fisher again making the save. 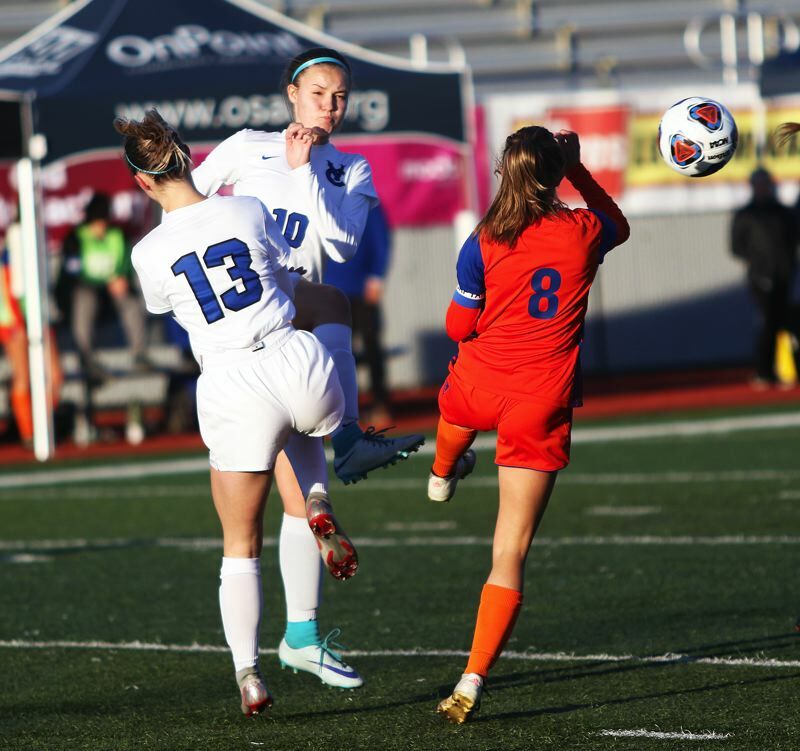 Brock had an open shot from 22 yards away on the left side with 14:40 remaining, but her attempt drifted just left of the Hidden Valley goal. Kawaguchi had another shot on goal with 12:06 remaining, with Fisher again making a save. 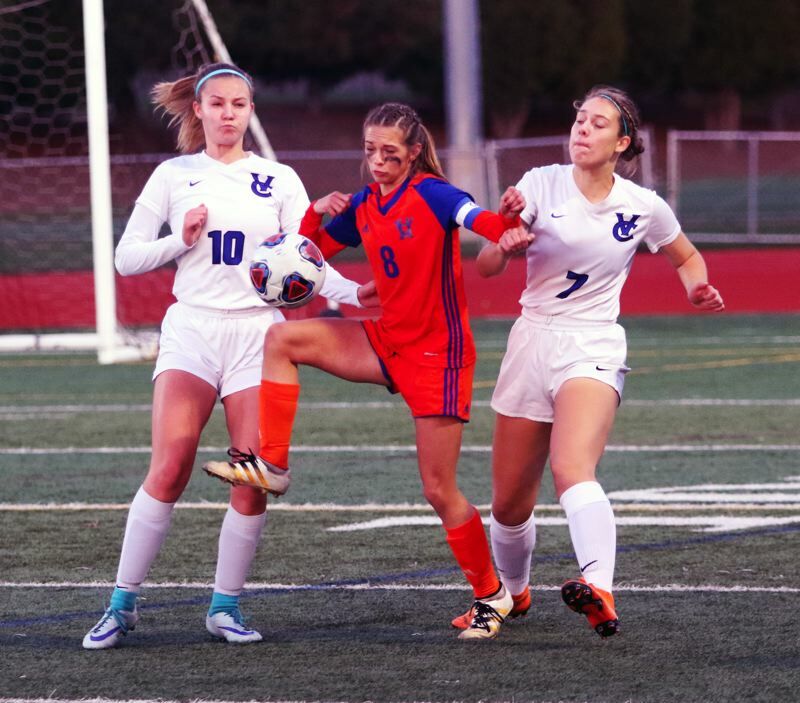 The Valiants had another chance when Brock curled a corner kick right in front of the Mustang goal, but Fisher was able to grab the ball right before leaping Valley Catholic senior Kate MacNaughton right before she was able to get her head on it. 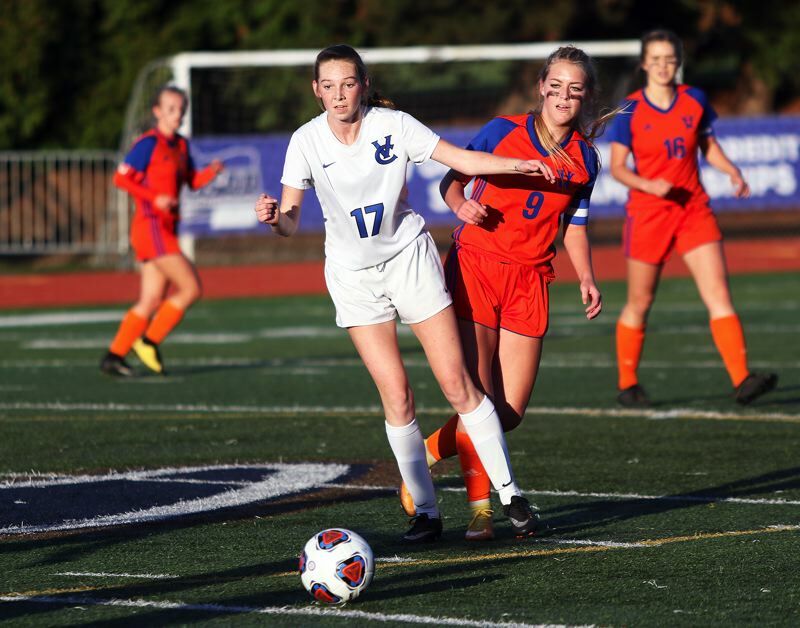 From there, Hidden Valley was to withstand the Valiants over the last couple minute to secure its 1-0 victory, and the championship. "We were really trying, working to connect and get one in, but Hidden Valley, they're tough and they got one early in and kept it up," Brock said. "It's unfortunate for us, but we kept working hard." "This was very fun," Kawaguchi said. "Leading up to it, there was so much talk and so much excitement. I think that, personally, I was happy to be here again. Even though we lost, and we wanted to win, it was just a great feeling being back here. Competing in a championship game is a feeling like no other." And, despite the hard-fought setback, the Valiants seemed to enjoy the whole experience. "We always have had a team that's very close," Kawaguchi said. "So, with our team chemistry, once we started playing for everybody on the team, and not for ourselves, we totally switched everything around, and we could do great things. And that showed with us getting here." "Honestly, it's a fun time to play at state," Brock said. "Despite the outcome, we had such a fun time playing together. On the way here, in the locker room, getting pumped up on the field, it was just a fun experience." For the match, Hidden Valley had eight shots on goal and four corner kicks. 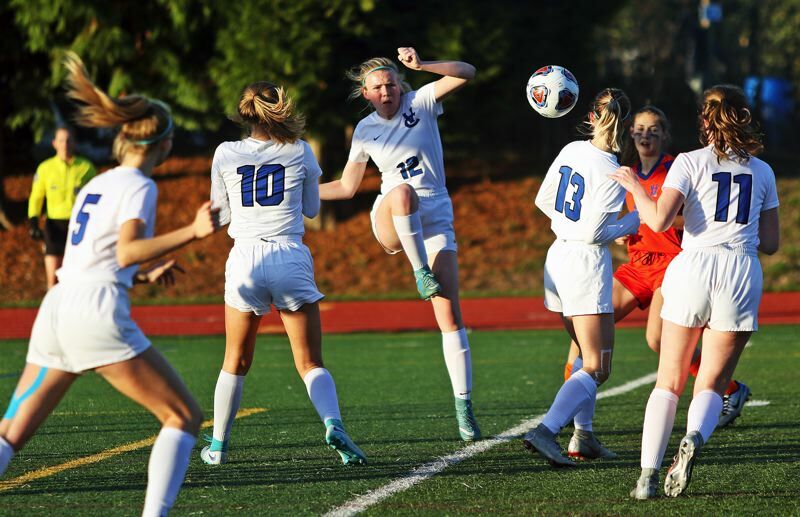 Valley Catholic had eight shots on goal and five corner kicks. 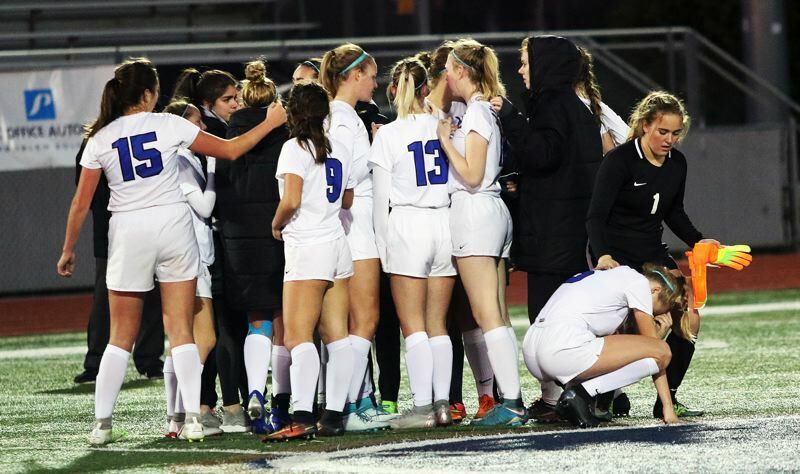 Other players on the Valley Catholic team include freshman Mariella Gunther, freshman Sofia Tubito, senior Hannah LeVeine, senior Sarah Jones, sophomore Lauren Snook, junior Shivani Naresh, freshman Victoria Pitt and sophomore Megan Birrell. Karin Hatch and Forrest Price are assistant coaches for the Valiants.